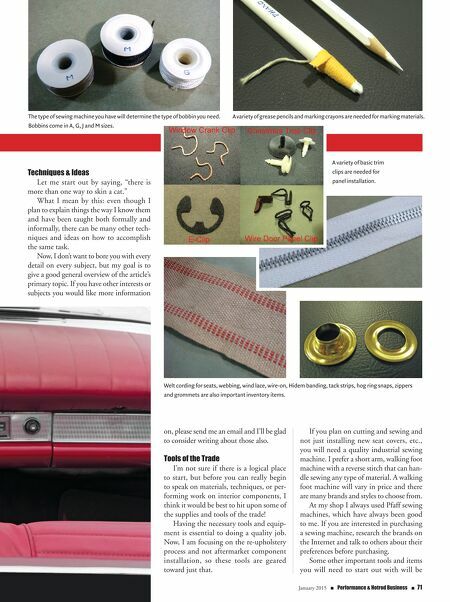 January 2015 n Performance & Hotrod Business n 71 Techniques & Ideas Let me start out by saying, "there is more than one way to skin a cat." What I mean by this: even though I plan to explain things the way I know them and have been taught both formally and informally, there can be many other tech- niques and ideas on how to accomplish the same task. Now, I don't want to bore you with every detail on every subject, but my goal is to give a good general overview of the article's primary topic. If you have other interests or subjects you would like more information on, please send me an email and I'll be glad to consider writing about those also. Tools of the Trade I'm not sure if there is a logical place to start, but before you can really begin to speak on materials, techniques, or per- forming work on interior components, I think it would be best to hit upon some of the supplies and tools of the trade! Having the necessary tools and equip- ment is essential to doing a quality job. 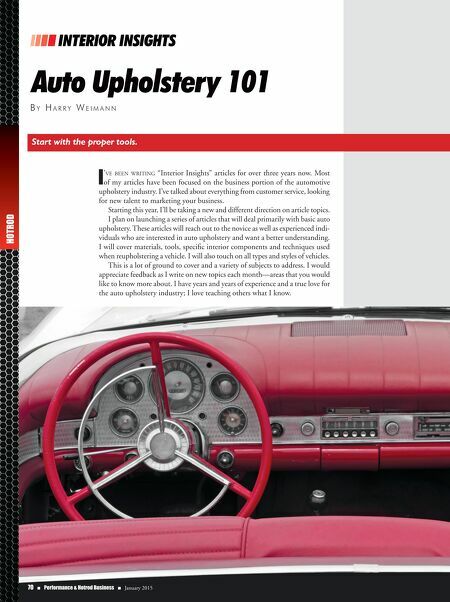 Now, I am focusing on the re-upholstery process and not aftermarket component installation, so these tools are geared toward just that. If you plan on cutting and sewing and not just installing new seat covers, etc., you will need a quality industrial sewing machine. I prefer a short arm, walking foot machine with a reverse stitch that can han- dle sewing any type of material. A walking foot machine will vary in price and there are many brands and styles to choose from. At my shop I always used Pfaff sewing machines, which have always been good to me. If you are interested in purchasing a sewing machine, research the brands on the Internet and talk to others about their preferences before purchasing. Some other important tools and items you will need to start out with will be The type of sewing machine you have will determine the type of bobbin you need. Bobbins come in A, G, J and M sizes. A variety of grease pencils and marking crayons are needed for marking materials. A variety of basic trim clips are needed for panel installation. Welt cording for seats, webbing, wind lace, wire-on, Hidem banding, tack strips, hog ring snaps, zippers and grommets are also important inventory items.